Many of us consider the reasons behind infertility in men and women to be put down to physical or emotional problems but this is not always the case.In the world around us and indeed with the food that we eat and the things that we drink, there are toxins that can be released into our bodies that can make infertility a real and tangible risk. A great many of us consider smoking to be one of the most common causes of cancer and heart disease but smoking also attacks the lungs, the throat and the reproductive systems of both male and female. 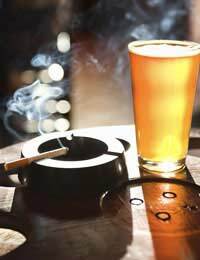 In men, smoking can lead to problems with achieving and maintaining an erection as well as damage to sperm counts. In women smoking can lead to Vasoconstriction- a condition that restricts the flow of blood vessels to the ovaries and the endometrial lining. In men this problem can cause damage the testes. Scientific studies now indicate that smoking one packet of cigarettes a day can greatly increase the chances of infertility and even more so if the individual has been smoking prior to being eighteen years of age. Alcohol, just like cigarettes, is another of the most common causes of infertility. Indeed even where infertility is not a problem with a partnership, the intake of alcohol consumed can have an effect on the baby itself once born – alcohol can lead to abnormalities in terms of size, weight, and congenital heart and brain defects. This is known as the foetal alcohol syndrome. Alcohol also affects the male sperm and can lead to a low sperm count. As sperm takes three months to develop a high consumption of alcohol can hinder its development. It is recommended that if you – or your partner – is suffering from infertility and there is a chance the condition can be reversed, then you should alcohol at all costs. This is perhaps a lesser known problem with sufferers of infertility but it is still important to discuss it. Many people suffer from eating disorders. However suffering from an eating disorder does not necessarily mean eating too much, it can mean eating not enough, which in itself can lead to all manner of complications. Eating disorders – particularly in women – lead to problems with what are known as androgens; these androgens are actually male hormones that are suppressed within the female. An eating disorder that leads to too much weight being gained – or again too much weight being lost – can produce high levels of this suppressed male hormone, which can cause problems when trying to conceive.An individual suffering from this condition may find that they are unable to conceive unless they lose on average 10% of their body weight. Again as with all of these conditions there are ways and means of reducing their effects and indeed in some instances reversing them completely. It is important to consult with your doctor if you are in doubt as to issues of fertility and allow them to carry out any tests that might be required. As always, when consulting with your GP, it is important to give as much information – and as much accurate information – as possible so that he or she may help you get back on the road to being more fertile.